The 3 way Concorde is a Visaton floorstander kit with quite an attractive design and with the brand new KE 25 SC ceramic dome tweeter. 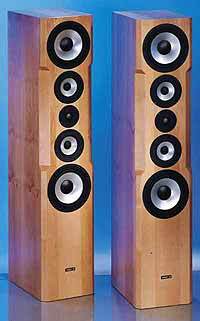 Due to the d'Appolito arrangement where the tweeter is surrounded by the two midrange drivers, the three dimensionality is excellent. By using a sophisticated crossover with timing correction like used by e.g. Dynaudio the tweeter is connected with correct timing. The Concorde is equipped with the latest technology. Therefore, it's a piece of cake for this speaker to reproduce all types of music material faithfully. The MK III version features a different crossover where the crossover frequency was reduced from 500 Hz to 300 Hz. Also the connection of the tweeter was changed to 18dB/oct. These measures result in a more even sound radiation at different angles, improving the sound especially in less dampened rooms. The absolutely neutral sound as well as the outstanding dynamics turn the floorstanding Concorde MK III into a jack of all trades suitable for any kind of music material. The Concorde MK III is - upon request - available with a high end crossover kit. Despite the much higher quality crossover the kit remains well priced since there are no higher labour cost. Of course, we supply an assembled high end crossover upon request.